The other day a friend and I met up for lunch at this awesome restaurant that offers both a vegan and non vegan menu. Everything from soup, salad to dessert had vegan options even the oil for dipping the bread they specify is vegan! The lunch was great and of course we decided to go for dessert and we split the Vegan Tiramisu. So this prompted me to get into the test kitchen to make one of my own. Honestly it wasn’t that hard! So either they tried too hard or not enough because whatever that was that they called Tiramisu, was a shame and often what puts non vegans off to vegan food! I was so sad that my friends first foray into vegan desserts was this monstrosity! Good thing I brought a box of the Chocolate Raspberry Rugelach I made the day before so we munched on those and I redeemed the Vegan Baking world for us! I’ll be meeting up with her again tomorrow and you can be sure I’ll have a slice of this Vegan Tiramisu in hand for her to try! Creamy, rum scented mousse with coffee and kahlua soaked sponge layers. Topped with a dusting of cocoa for that authentic taste and look. Perhaps I should bring a slice to that restaurant to show them how it’s done!? At any rate, try this recipe for yourself. It is very simple and I had it all assembled in less than 30 minutes. As you will see in this video (as well as listed in the recipe below) I am in love with Coconut Whipping Cream by Nature’s Charm. So much better than whipping the fat from the can of coconut milk as this product is so smooth and creamy and there is no waste of that liquid from the coconut milk cans as we are used to. I hope this becomes widely available but for now, even for me in New Jersey I have to go to Wegmans or Whole Foods to find it. It comes in at $3.99 a can, but honestly you will end up paying the same if not more for 2-3 cans of coconut milk and wasting half the can just to get enough whipped cream for a recipe. So be sure to ask in your local supermarket that they start to carry this stuff, that is the only way they will know it is in demand! Ok now let’s get back to the recipe! 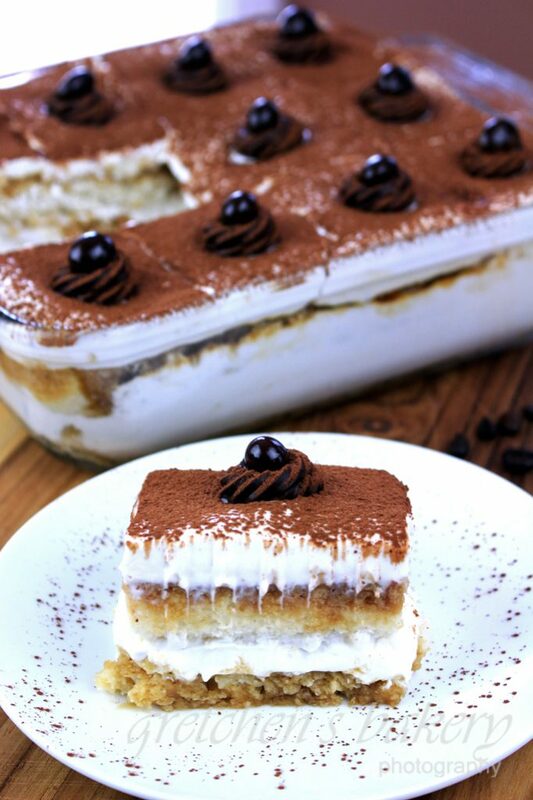 For those who do not use alcohol in their cooking and baking, I will suggest to use another recipe since classic Tiramisu is made with a heavy amount of alcohol. The rum of choice for me has always been Meyers Dark Rum. But I have also used Bacardi Gold and Mount Gay Rum from Barbados. All worked great and tasted delicious! So whatever brand you go for, just make sure it is a dark rum and not white and not too bottom shelf since you will notice the quality in the final result if you cheap out here. As for the actual “cheese” part of the recipe, I was actually skeptical that I would be able to pull it off, since traditional Tiramisu is made with mascarpone cheese and has a very distinct flavor profile to it. One thing I want to note that we have to always keep in mind when making vegan desserts is that of course we will never get an exact replica. Sometimes we hit on better tasting creations (my peanut butter cupcakes for example! )and sometimes we get very close to the original in taste and texture. Since we are not using exact ingredients (duh!) it will never be exact. This vegan tiramisu I have created is luscious! It is a very close replica of the original, using vegan cream cheese in place of the mascarpone and in my opinion the coconut whipping cream leaves no taste of coconuts behind. I will note that I am partial to using Tofutti brand cream cheese in all of my baking and I recently tried Follow Your Heart cream cheese, with not so great results in this particular recipe. For me, it tasted too “citrus-y” which is probably because they have mastered getting cream cheese to taste the most like “real cream cheese”. I think it would be great in my vegan cheesecakes, but I did not like it here in this Tiramisu. However after the first day all the flavors mellowed and melded together and that prominent “citrus” taste I was getting went away. Like any Tiramisu recipe though, it WILL get better as it sits! So I would advise to make this one day ahead of time before serving. It just gets better as the days pass. Divide the batter evenly among the 2 pans and bake in a preheated 350°F oven for approximately 25 minutes or until they are springy to the touch when you gently press the centers. While they are baking and cooling, prepare the simple syrup by combining the water & sugar together in a small sauce pot, bring to a boil then boil for 2 minutes. Remove from heat and add the coffee granules then the Kahlua. Prepare the tiramisu cream by first whipping the coconut cream to medium peaks. Tiramisu must stay refrigerated and can be stored covered for up to 1 week. How strong is the rum flavour in the tiramisu cream? I was wondering if I could use 60ml of rum instead of 120ml but I don’t know how it would affect the flavour. I have used a few of your recipes and they have always been a hit. Thank you for the wonderful work! I hope you get better soon. for other recipes, will the coconut whipping cream whip to stiff peaks? thanks. Hi Gretchen I followed you back in the crumbboss days. Now recently I’m transitioning into the vegan lifestyle and I was thrilled when I found out that you’re vegan too and share your vegan recipes. 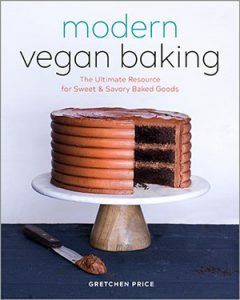 I know that you have the best recipes and I always get so many compliments when I bake one of your (non-vegan) recipes!! Now my problem is: I tried to make this vegan vanilla sponge cake and when it came out of the oven it looked fine and it smelled great. I waited to let the cake cool down before unmolding it. When I tried unmolding it the cake totally broke down into pieces. I than decide to make crumbles and use that for the tiramisu later, I think that will be fine because it tasted SO GOOD, it was moist, fluffy, airy… But for next time I really like to know what went wrong. The only thing I can think of is the vegan butter that is maybe not binding enough, I used the Alpro brand (I think it only exist in Europe) it is a soy based butter and the package says “baking and roasting” and it also specifies good for cakes. Can I maybe add whipped aquafaba for binding the batter? I know it is difficult for you to solve problems from far away but I hope you can help me? I doubt it is the vegan butter, but maybe more that it needed parchment paper lining? I just made this last night as a matter of fact and it came out really great, but I did use parchment paper lining in the pan. Yes I forgot to mention, I used parchment paper in the baking tray. But it’s not just unmolding. Just by going through the cake with my hands it became crumbles really easily. With normal cake I have to “grind” the cake in between my fingers to make crumbles, with this one just taking “the cake” in my hands it became crumbles. Maybe xanthan gum will make it bind more? It will print but this annoying ad for Hawaii blocks part of the text! Really? Hmm. Im not sure, but I use my desktop for everything, not my phone. I assume you are too since you are trying to print it? What do you think about using a meringue instead of the whipped coconut? I have looking at some dairy ones and they tend to do a whole egg whip and then fold in the mascarpone. It would lead to lighter texture. Possibly reducing aquafaba to a pretty thick consistency (or your agar stabilztion) to replicate that style meringue. Thoughts? Very good. All i had for rum was captain. Wholly booze-y! Woohaaa,. i used the vegan cream cheese recipe for your baking book and it turned out great! The last time i had TIRAMISU was in Italy. Do I need to refrigerate the coconut whipping cream before whipping? If I do will it whip better? Thanks. The coconut milk in cans must be refrigerated (preferably overnight) so you can separate the fat from teh liquid and then whip, so yes. 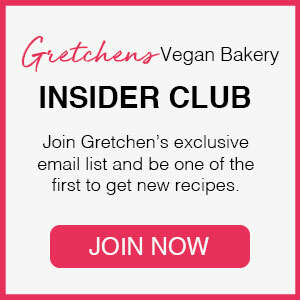 Gretchen, i love that you have great vegan recipes. Please, please leave your non vegan site up for those of us who those of us that still enjoy those recipes, please.